DJ Matthew Heller is a DJ who takes his craft seriously and has been honing it for almost 15 years. Winner of the Review Music Award for best DJ 4 years in a row (2010-2013) and Great Lakes Regional Lifestyle Magazine’s Best of the Best DJ in 2010, he has been recognized as one of the best in his field. 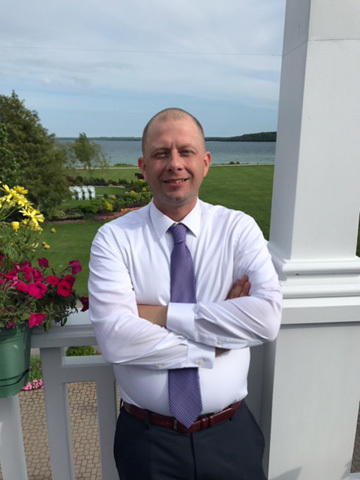 His experience is diverse ranging from weddings, school dances, and in store promotions to club residencies, Zumba classes, and concerts at the Dow Event Center. Matthew is a versatile DJ with a deep knowledge of music from all eras and genres. Mixing tracks with ease, he can keep the energy moving and dance floor packed with his seamless sets and tasteful selection. 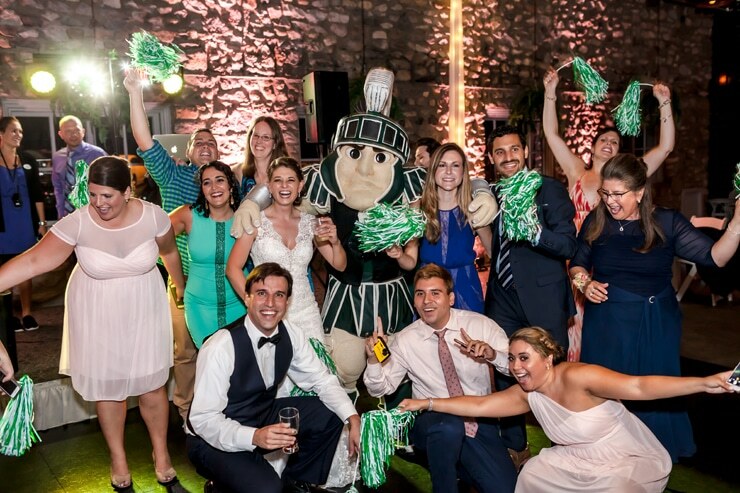 Everyone is guaranteed to have a great time when you choose Matthew for your next event! 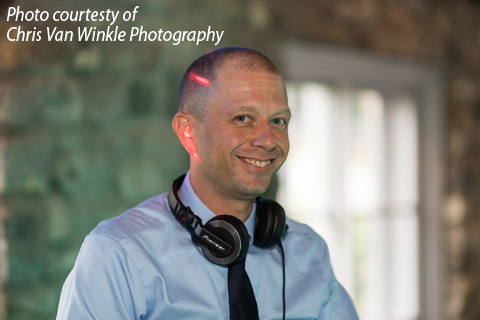 DJ Matt can do an entire wedding with vinyl for the bride that wants a “throw back” wedding! Matt brings several crates of “wax” & can start with Sinatra into the classic rock with a touch of 80’s dance right up to today’s biggest hits! 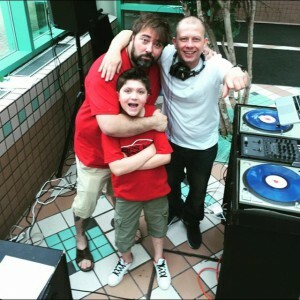 DJ Matt Chillin’ with Pat and his son at the American Heart Association Heart Walk. Pat is the co-host on the morning show on Cars 108.
for the Michigan State Business Professionals of America Annual Conference! Rusch Entertainment DJ Matthew Heller Does it Again!!! 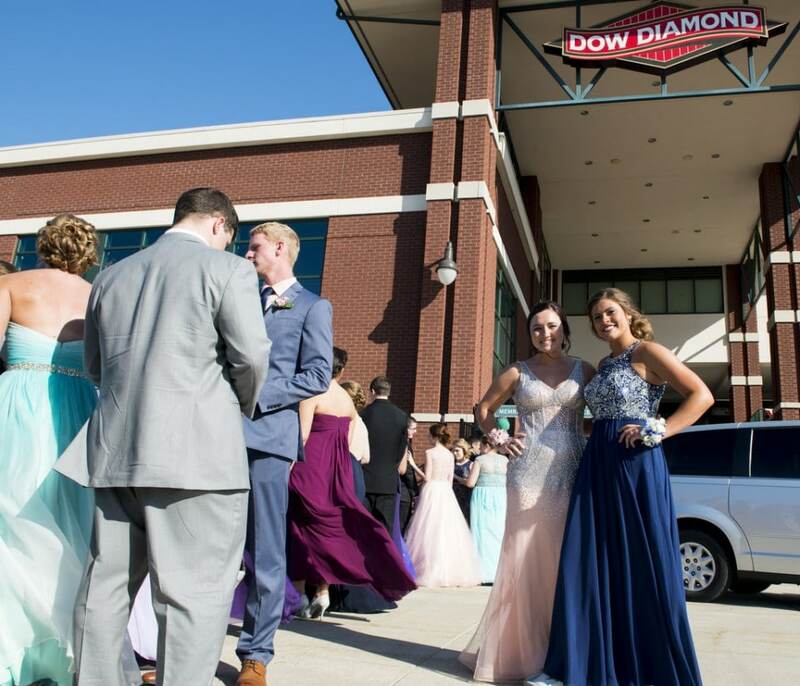 Hemlock High School Prom Kicks Off Local Prom Season at Dow Diamond! 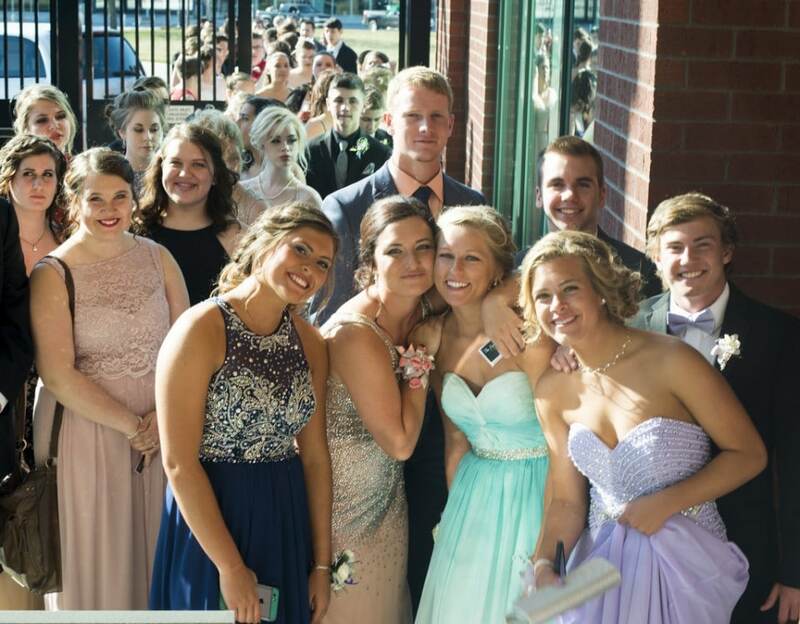 MIDLAND, MI — Students from Hemlock High School kicked off prom season 2016 with an event at Midland’s Dow Diamond. 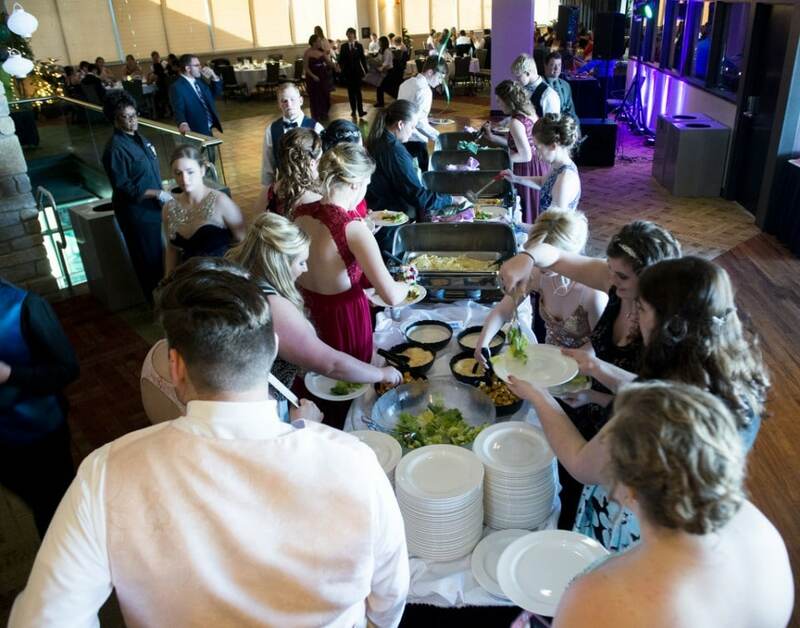 The school’s prom, themed “The Path to Enchantment,” was held Saturday, April 16. See the fun in the gallery to the right. 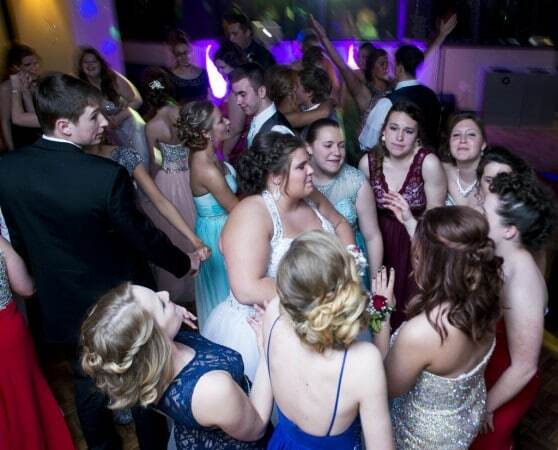 Hemlock’s prom is the first of more than a dozen for Saginaw County schools in the weeks to come. 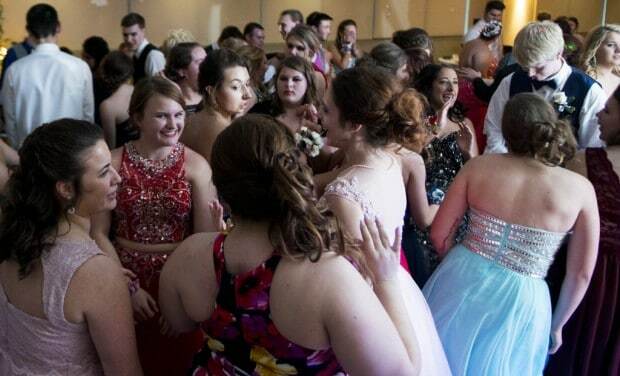 Prom season runs from mid-April through late May. 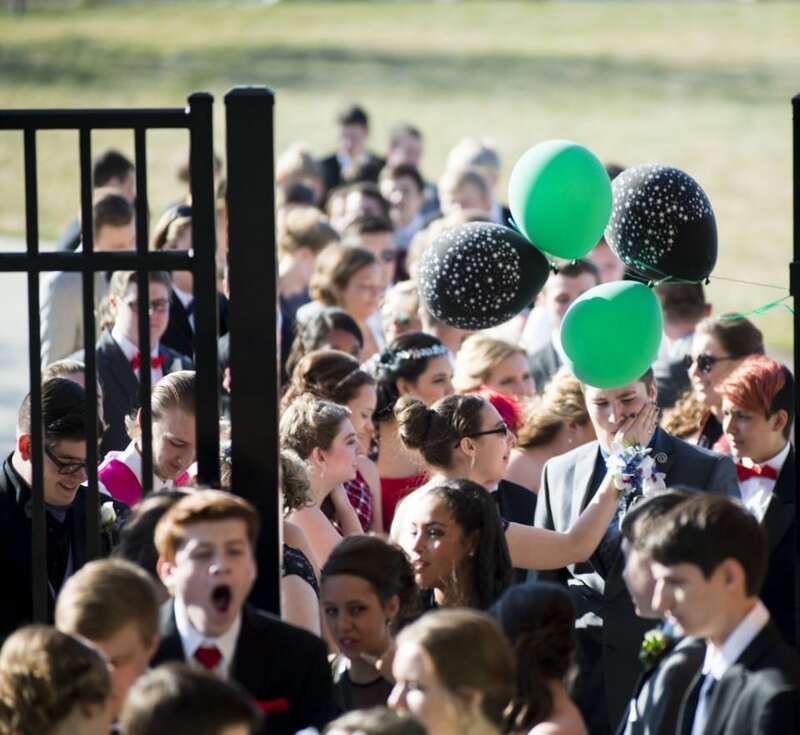 Check back throughout April and May as we provide coverage of proms across the region. Mark Tower covers local government for MLive/The Saginaw News. DJ Matthew provided fantastic entertainment for the “King of Wings” event hosted at The Dow Event Center. More than a dozen local restaurants and businesses competed to have their wings declared the best. There were also several wing eating contests, including the “Celebrity Wing Eating Contest” pictured. A portion of the proceeds from this event went to support Hidden Harvest, a nonprofit organization that helps feed the hungry in Saginaw. Dean, The wedding went great the weather was perfect and the guest plentiful. Matt was an awesome DJ, not only when it came to playing music but also keeping us in the time line. He coordinated with our photographer and together they nailed it. Really a five star guy, all the way from his attitude to some of his improvised song choices. I would recommend you guys as well as Matt to anyone. Everyone had a great time and I hope he enjoyed himself as well. As for the photo booth it went just as well. She also did a great job. Plenty of props and wonderful attitude. We had a great time and I hope they did too, so happy we chose Rusch! Thank you so much for doing our wedding! 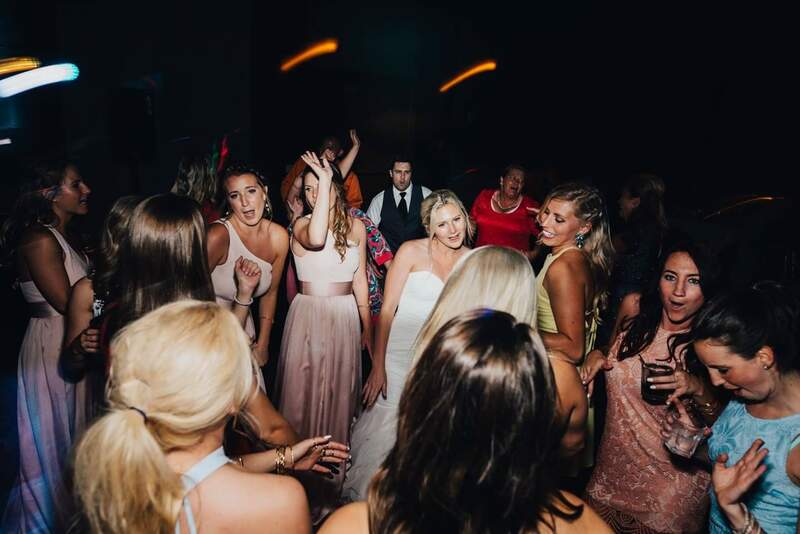 You had all of our guests up and dancing and our guests are still talking about how much fun the wedding was! Without you, it wouldn’t have been possible. Hi Dean, Matt Heller was an AMAZING DJ!!!! We had a phenomenal wedding reception, and Matt was a huge part of that. He was easy to work with, super flexible, and had the whole place dancing the whole night. You said he was a great DJ, and you didn’t exaggerate! Thanks! Everything was awesome! Matt did a wonderful job at our reception keeping everyone dancing and having fun! He was so laid back, yet very organized and on top of keeping things moving. We had a blast and so did our guests 🙂 We would recommend Matt to anyone looking for a great DJ! Thank you! I think our students enjoyed the evening. 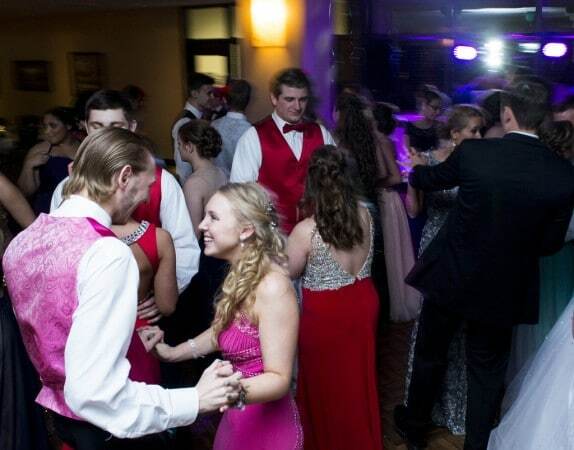 Just knowing out students, there were a lot more students on the dance floor than we expected to see. Everything was great and we have passed along our thoughts to next year’s advisors. Hi Dean! 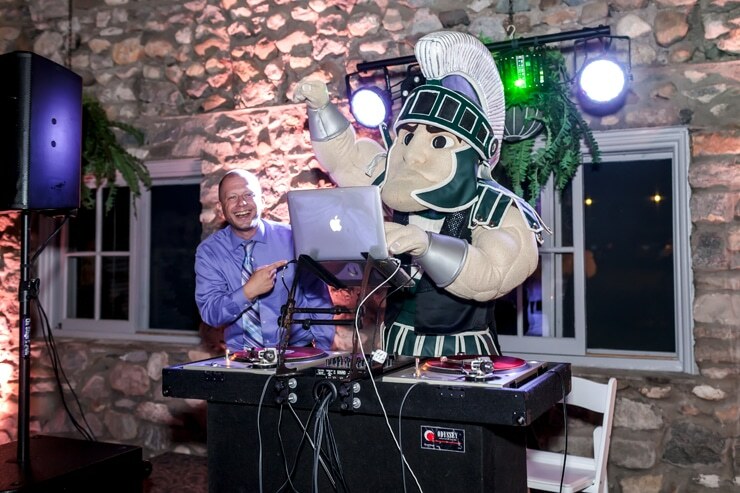 I Just wanted to let you know – DJ Matt worked our VIP event last week. He really got the vibe of our customer base. I can’t tell you how many customers approached me – saying how much they enjoyed his selections. He truly set the tone for a great night. I know we have an upcoming event and we would love to have back in Howell. Thanks! Hello Dean! 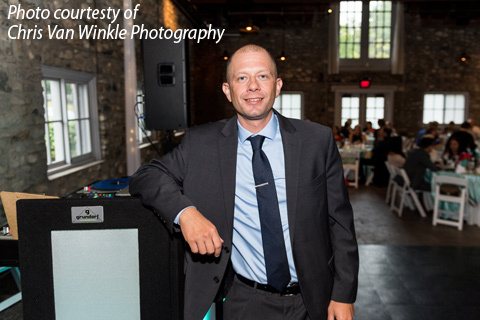 I want to tell you how impressed we were with DJ Matt and the service he provided at our wedding this past Friday. Matt was very professional, had a get taste/sense for music we wanted and was overall an amazing resource to have. 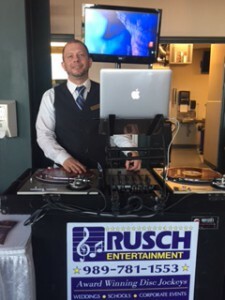 We are so happy that we chose Rusch Entertainment to DJ our wedding and will recommend it to everyone looking for a DJ service!!! Hi Dean, All went well! Matt did an amazing job as usual for the 16h year for the CMU-Back to School Fair and was very professional and punctual. Thank you again and we look forward to working with you again! Much thanks for recommending Matt for our DJ. He really did everything you said he would do. He really knew what he was doing to engage our crowd. I appreciated his service on our most important day very much. He gave everyone a fabulous time on the dance floor!! He also made the evening a pleasant experience for all generations. Matt went above and beyond to make sure our wedding reception was everything that we wanted it to be! Matt politely and professionally gave us reminders throughout the night when it was time to cut the cake, throw the bouquet and for the bride and her father’s dance. He took… Read More requests from guests, but also made sure that all of our guests were entertained by playing some classic rock for the parents/older crowd. Our dance floor was full up until the last song. He made sure to ask my husband and I what we wanted for the last song of the night, which was a nice gesture after playing 7 hours of music. 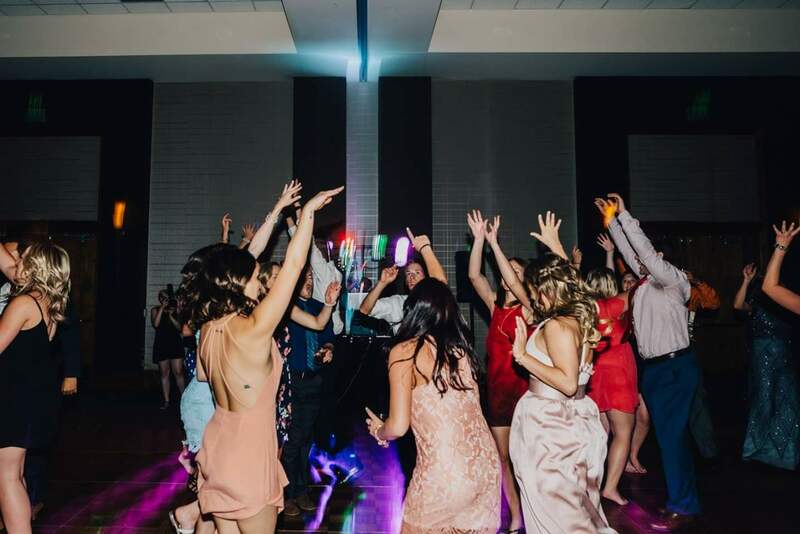 I would highly recommend Matt to anyone who is looking for a professional, experienced DJ that is highly attentive to detail and does not try to make your reception about himself. We cannot thank Matt and Rusch enough for making our reception so much fun!! PS: Matt was Better than Expected – We had 10-20 compliments! Hi Dean, Matt was literally the best DJ of all time. The dance floor was always full and I had at least 20 people come up to me and say that he was the best DJ they have ever heard at a wedding. He knew exactly what he was doing! Matt was excellent! He did such a great job throughout the day, I absolutely loved having him as our DJ. Thanks for helping us have such a fun and memorable wedding day! I’m so glad you emailed. I was meaning to call for you specifically to rave about Matt! He did SUCH an incredible job DJ-ing and MC-ing our reception! He was so flexible and worked so well for us. We could very easily tell that he wanted the best for us and wanted to make our event perfect. His music selection was great, we could tell he was experienced, and he was just so easy and nice to work with. Even further, whenever we called anyone your employees were friendly and had all the info we needed in a timely manner. We are SO SO pleased and will definitely recommend Matt and your business to all of our friends! DJ Matt was a huge success. Next year we will need to have him there longer, if we do it again. We had lots of compliments. The girls really enjoyed him!! Very happy! Hi Dean! Matt was great and the night was fabulous! We will not hesitate to use you again next year. We will need to increase the photo booths next year-2 was not enough for us. I’ll be in touch when we have our date for next year. Thanks! We loved having Matt do our event! He was very professional and extremely helpful when we needed him to do some extra announcing. We’re having a recap meeting in another week and I may be able to pass along more feedback, but I know the crowd loved his choice of music, and the 5 ladies who were up on stage dancing for the after-glow party REALLY loved his choices!! 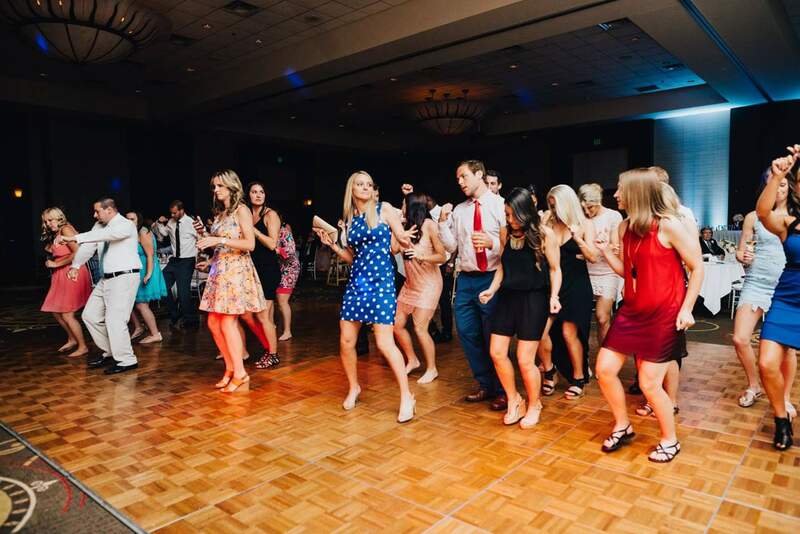 It was our mistake that we didn’t create more of a dance floor for guest to really have some room to party, but we had about 50 more people attend this year than last so although we thought about it, we just forgot to implement moving the tables! I’ll pass on more feedback as I get it, but it was great to work with Matt and we hope to use Rusch entertainment again next year!! Thanks to Rusch Entertainment for setting us up with Matt. He did a great job and was dressed appropriate for the occasion. DJ Matt made sure to check in with us throughout to ensure our celebration was perfect. The dance floor was PACKED the entire night! Heck of a way to ring in the New Year! Thanks again!! Candice & Ryan – Porto Bello Italian Restaurant, Grand Haven – NYE Wedding! Matt was amazing. Our DJ had not gotten back with us and it was only a week before our wedding. I found these guys on here and contacted them. He was the only one left and looking for a gig. They are absolutely amazing and I could not have asked for a better DJ. Even my husband was blown away by them. Seriously the best decision. Thank you Rush Ent. 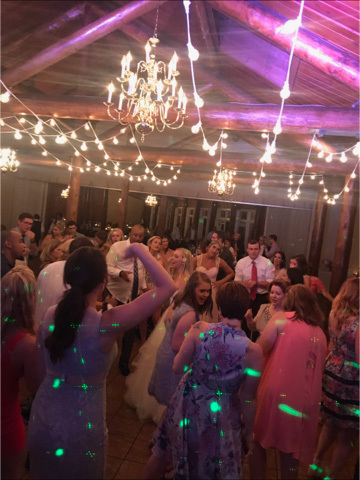 the first time we witnessed your DJ’s professionalism was at one of our best friend weddings and knew that we had to have you for our special day as wwll!! May your business continue to grow!!!! Matt went above and beyond to make sure our wedding reception was everything that we wanted it to be! Matt politely and professionally gave us reminders throughout the night when it was time to cut the cake, throw the bouquet and for the bride and her father’s dance. He took requests from guests, but also made sure that all of our guests were entertained by playing some classic rock for the parents/older crowd. 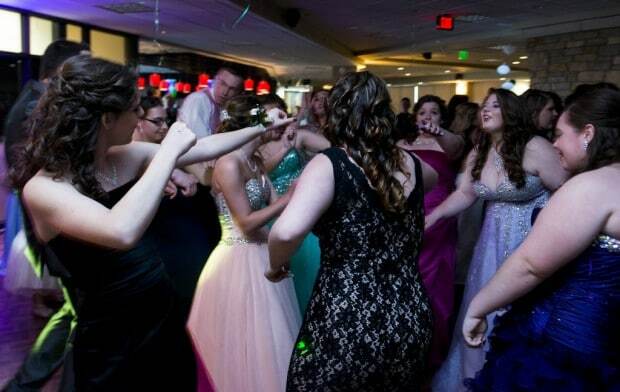 Our dance floor was full up until the last song. He made sure to ask my husband and I what we wanted for the last song of the night, which was a nice gesture after playing 7 hours of music. 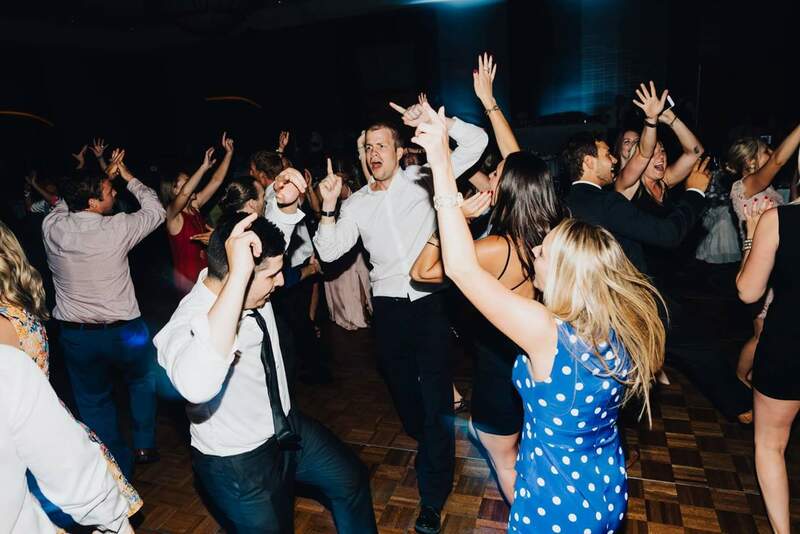 I would highly recommend Matt to anyone who is looking for a professional, experienced DJ that is highly attentive to detail and does not try to make your reception about himself. We cannot thank Matt and Rusch enough for making our reception so much fun!! Matt was Awesome!!! He was perfect! Matt was so in tune to what the kids wanted to hear, and it just seemed to flow perfectly together. Thank you for sending him. The kids all complimented him numerous times. 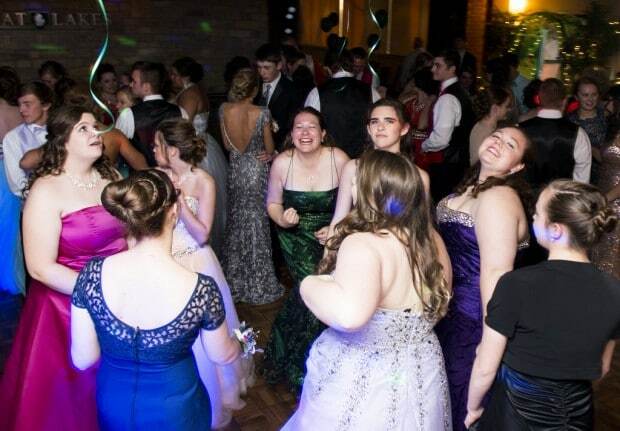 But the best compliment was that the dance floor was packed all night long!! Thanks for taking such good care of us at the Dow Diamond! Your company did a wonderful job!!!!!!! Thank You so very much for the awesome time! Dean, Matt did an amazing job thank you so much for being a part of our party. Will definitely be using you again next year and will spread the word to any upcoming events with family and friends. Matt was awesome at the Jan High School Semi Formal! Thank you much for a wonderful event! I would like to reserve him for our October Homecoming Dance. Could we have Matt, again? Thank you! Everything went very well with Matt. Thank you! Matt did a great job. 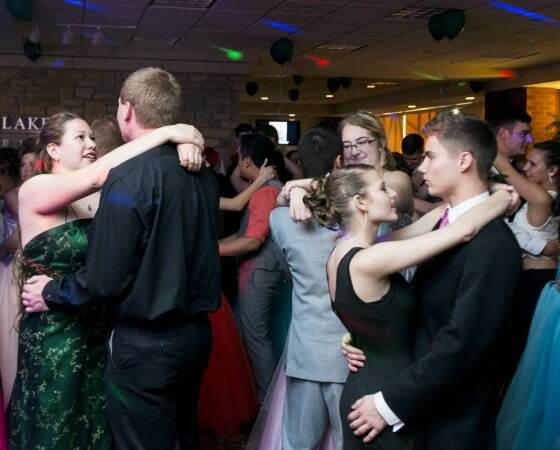 These type of “social” gatherings are challenging to get them on the dance floor & THEY WERE OUT THERE!! He brought a connector which allowed our guests to play music from their phone. It hasn’t been discussed yet … but since it was such a success, I don’t know why we wouldn’t have you back next year. Thank you for the email reminder. We’ve been pleased with the services Rusch Entertainment has provided us the past two years. What a great experience – professional when making arrangements, took the time to know my event and attendees, worked hard to stay in my budget. As far as the entertainment?? What a hoot! We had people kicking up their heels that I never expected. We had photo booth, magician, and DJ. They all participated in our party, they didn’t just show up to earn a buck! We were 100% satisfied!! 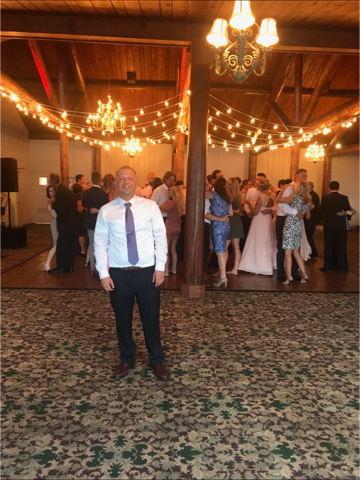 Matt H. Did such an awesome job as a DJ for our wedding everyone danced the whole night there was not one time the dance floor was empty!!! So happy that we chose you guys for our wedding!!! Also the photo booth was so much fun captured so many awesome moments and everyone having a great time!!!! Thank you for all that you have done for our wedding and making our night even more special!!!!! Sean and Rachael – Wedding at the The Jewel in Grand Blanc with over 200 people. 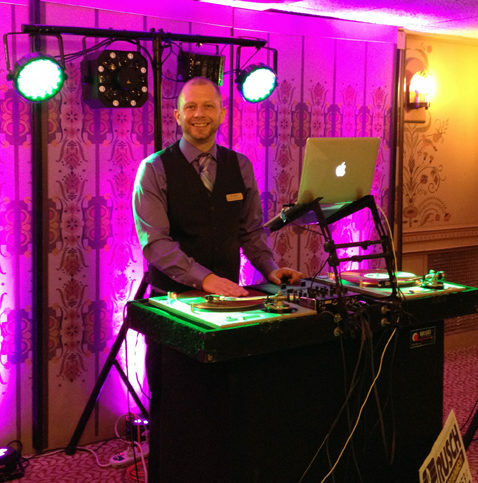 Yeah we absolutely loved Matt – DJ for U of M’s Alpha Zi Delta Sorority Formal – and how easy he was to work with! I was out on the dance floor all night. I have a group picture I can send you if you would like. Thanks so much for helping us so last minute, we really appreciate it and will be contacting you guys soon about a dance we have coming in the spring! Thanks again so much! !